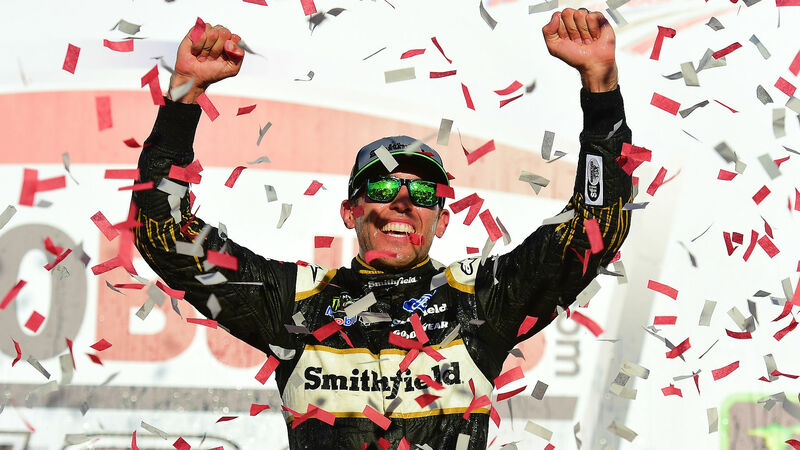 The NASCAR Cup Series playoffs continued Sunday from Talladega Superspeedway, where Aric Almirola took the checkered flag in the 1000Bulbs.com 500. A wreck with three laps to go forced overtime, and teams were faced with crucial decisions regarding fuel. It wound up being Kurt Busch’s downfall, as he ran out of fuel on the final lap to allow Almriola to pass him and claim the victory. Busch ended up finishing 14th after leading 108 laps on the day — the most by any driver. Clint Bowyer, Ricky Stenhouse Jr., Denny Hamlin and Joey Logano finished second through fifth, respectively. Last week’s winner, Chase Elliott, finished 31st. Elliott was also leading the points standings heading into the race. Sporting News provided live updates and highlights from the race. 5:36 p.m. — Bowyer, Ricky Stenhouse Jr., Denny Hamlin and Joey Logano finish second through fifth, respectively. 5:34 p.m. — Kurt Busch runs out of fuel on the final lap and Almirola takes the checkered flag! 5:32 p.m. — Caution’s still out, but a lot of drivers are facing fuel concerns. Blaney out of fuel. Harvick out. Kez also out. 5:21 p.m. — Caution flag comes out with three laps to go after a wreck involving Alex Bowman, William Byron and JJ Yeley. A multi-car crash unfolds late at @TalladegaSuperS . 5:18 p.m. — Five laps remain! It’s Bushc, Bowyer, Harvick, Almirola and Blaney in the top five. 5:13 p.m. — 10 laps to go! It’s Busch in the lead with Bowyer and Harvick following close behind. 5:04 p.m. — 24 laps remain and the green flag’s back out. It’s Busch, Bowyer and Harvick out in front. 4:58 p.m. — Caution’s out due to a…tire? 4:53 p.m. — 30 laps to go and it’s still Busch, Harvick and Almirola out in front. 4:44 p.m. — Nearing Lap 150 and it’s Busch back in front followed by Harvick and Almirola. 4:29 p.m. — Caution’s out with 52 laps to go as Jamie McMurray wrecks. 4:22 p.m. — 60 laps to go and Keselowski’s out in front. Joey Logano in second and William Byron in third. 3:59 p.m. — Green flag comes back out with three laps left in Stage 2. Three laps to settle Stage 2 at @TalladegaSuperS ! 3:53 p.m. — Kyle Larson wrecks with six laps left in Stage 2. Caution’s now out. Put it out! @KyleLarsonRacin goes around down the backstretch. 3:41 p.m. — 90 laps in an Harvick is still the leader. Bowyer following close behind in second. Aric Almirola in third. 3:29 p.m. — 75 laps in an Harvick’s the leader with Bowyer in second. 3:24 p.m. — Green flag’s back out on Lap 66. Kevin Harvick’s in front followed by Bowyer. Lap 63: Caution is out! @JimmieJohnson spins in the tri-oval and hits the inside wall. 3:13 p.m. — Green flag’s out for Stage 2 with Ryan Blaney and Clint Bowyer out in front. STAGE WINNER: @KurtBusch keeps his SHR teammates at bay to win the opening stage at @TalladegaSuperS . A vibration forces @keselowski to pit road with 14 laps to go in Stage 1. 2:47 p.m. — Pretty quiet race so far. Almost 40 laps through and Busch is still the leader. 2:34 p.m. — 20 laps in and Kurt Busch is your leader. He’s led 18 laps so far. 2:22 p.m. — 10 laps in and Kurt Busch is your leader. 2:13 p.m. — Green flag’s out and they’re underway! The wait is over. We are GREEN at @TalladegaSuperS ! 1:59 p.m. — Here we go! 1:55 p.m. — Flyover’s complete. Race start is just moments away. 1:35 p.m. — Just over 25 minutes from race start!